Quote Reply Topic: Who's Ifrika Vermaxine ??? I tried to search the North African and Algerian sources , but there is no information !!!! Do you have any information about Ifri Vermaxine' personality? I m Waiting for ur replies my dears .. I tend to think the name is fictional, of French origin, like the passage you quote. However, I cannot read French and so I cannot get any more details to check on. It sounds like he is attributed to Algeria, in North Africa, 1000 BC. I would wonder what historical source would refer to back then. Written sources do not survive from that region and that time. So the question how the transmission of such a story and name would occur, is itself a problem. I am not saying you are wrong, I am just saying I got nothing. Figure out what you know about him (her), and study what you can. Is the name plausible for someone at that time, (onomastics is the science of names), or is it not? 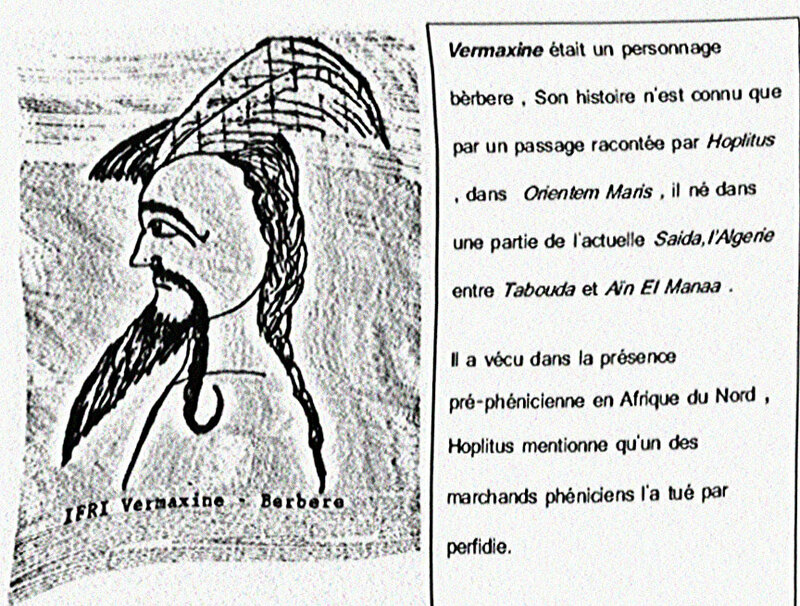 The first part says that Vermaxine was a Berber person. There are also words meaning North Africa and Phoenician, a language that became extinct in about the 5th Century..
Ifrika could possibly be African. You really need someone who can read and speak French. or maybe he want to generate hype for such a character. but if he did, coming from 1000 BC, he would be pretty obscure. probably tell you if the name is one of ancient or modern construction. "un passage racontee" = part of a story??? So, very basically, we have a reference to a Berber man called Vermaxine who lived in the time before the Phoenicians. I would not have thought that Vermaxine was a Berber name, it sounds more early Germanic to me. That's about as far as I can take it. I note that you have searched a number of other sites for this information. What is the name of the book that you refer to? I found a few things. Does it make any more sense?